When I first became a merchant on the Cortland corridor, I belonged to the Cortland Merchants Association. We held long drawn out meetings at various locations along Cortland. I attended when I could, and I always hovered over thinking this could be better but not really having any solutions. Over the years I have seen so many different versions of our group with many different folks entering the fray. There has been drama, personal battles, accomplishments and some wonderful strolls. I love our current incarnation. Now called the Bernal Business Alliance, four of us (Lynn, Arno, Laurie and I) run the organization as a team. We’re friends, and all of us are deeply committed to our community. I encourage you to join if you run a business in Bernal. If you’re already a member please pay your dues for 2018! We have an updated vintage style map in the works that will be printed this year and your dues pay for this. 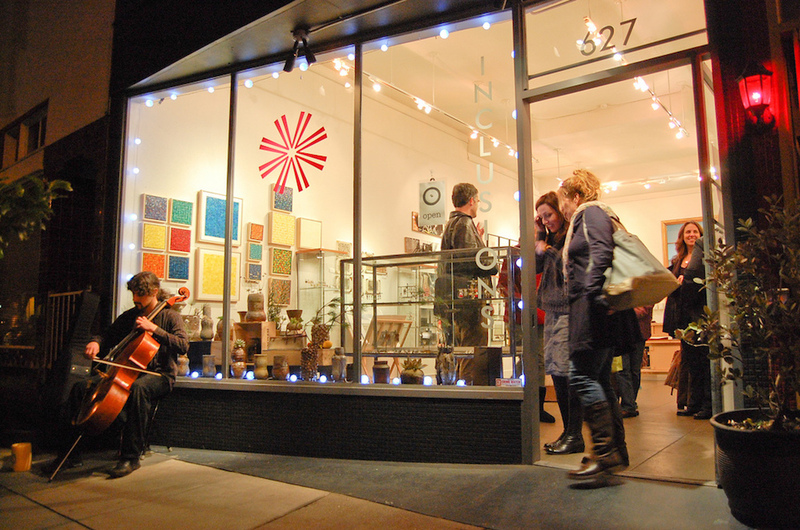 As you know, included among our many blessings here in the Dominion of Bernalwood are two terrific commercial districts; each of which now plays host to its own holiday celebration. TONIGHT, Friday, Dec. 8 from 6-9 pm, the fabulous merchants, chefs, and barkeeps along the La Lengua stretch of Mission Street will hold the glamorous 2017 Mission Bernal Holiday Walk. The Mission Bernal Merchants Association is excited to invite San Francisco to explore the vibrant Mission Bernal small business community on Friday December 8th, from 6pm to 9pm. The numerous locally owned restaurants, bars, galleries, coffee shops, and other businesses that line Mission Street from Cesar Chavez Street to Randall Street—along with businesses on adjacent side streets such as 29th Street—will open their doors and put out their welcome mats to the city at large, in a neighborhood celebration aimed at encouraging neighbors and visitors alike to peruse their wares, get to know local business owners, and sample the neighborhood’s diverse flavors. 2 for 1 ice-cream cones at Mitchell’s Ice Cream 688 San Jose Ave Try the eggnog, peppermint candy, cinnamon snap, or ginger spice to get you holiday happy. Tens of thousands of years ago, in the time of our Bernal ancestors, a joyous community of elves lived on Bernal Hill. Each year, during the early days of the winter season, these proto-Bernalese would gather on the land we now call Cortlandia to celebrate the arrival of the season of lights. Today, the Bernal Business Alliance carries on this ancient ritual, in the form of the glamorous Cortland Holiday Stroll. The 2017 Holiday Stroll happens this Thursday, Dec. 7, from 6 to 9 pm, and Bernalese of all ages are invited to partake of the festivities. Come one, come all, to the 8th annual Bernal Heights Holiday Stroll, this Thursday, December 7th from 6:00 – 9:00 along Cortland Avenue! Stores will be open to help you with your local holiday shopping, and they’ll be offering treats and libations along the way. There will also be live music and caroling to add to the festivities. The Bernal Heights Neighborhood Center at 513 Cortland, will be taking photos with Santa and strollers of all ages, for a recommended donation of $5.00. They are also collecting new, unwrapped toys for their annual toy drive until December 15th, so buy a little extra to give back this season. Happy holidays, and see you there! Check out the BBA website for more detail on participating merchants and their extra-special Stroll festivities. Security camera footage shows the intruder entering Healthy Spirits at 5:30 am. It’s tough to be a merchant in San Francisco — as Heathy Spirits discovered yet again today. In the early morning hours today, thieves broke in to the Healty Spirits store at 249 Cortland to steal the cash register. This is the second time this has happened to Healthy Spirits; a similar incident took place in July 2016. This morning approximately at 5:30 I received a call from police notifying me of a break in at my business located at 249 Cortland Ave. The video footage shows that one of the thieves opened the front door using a crowbar and the second thief enters and proceeds to yank the cash register and runs away with two cash drawers. The cash drawers had a small amount of money but the robbery leaves me with a broken front door and a very expensive POS system to replace. This same scenario almost exactly happened back in July 2016 where the thieves were only interested in the cash register as well. It is days like today that I choose to count my blessings and I spend my time thinking about how lucky I am to be a part of this wonderful Bernal family. I shall restore whatever was damaged as soon as possible and I can’t wait to be back serving our clients and our Bernalese family at large. Anyone with further information about this incident is encouraged to contact SFPD Ingleside Station at (415) 404-4000. Back in 2015, Bernal Neighbor Eliza Laffin announced plans to open a pizza shop called Red Apron Pizza at the corner of Folsom and Bessie, at the western end of Precita Park. Yet it wasn’t to be. The renovation effort soon bogged down in negotiations with the property owner about who was responsible for various structural improvements, water damage abatement, and sewage system repairs, with the result that work on Red Apron Pizza was suspended for more than a year. On September 18, 2017, I made a very difficult decision to terminate the lease for Red Apron Pizzeria at 3214 Folsom Street. My restaurant – while currently a figment of my imagination – remains the same, as Red Apron Pizzeria. The sign in the front window is gone. I feel like I let my neighborhood down.. I’m sorry. But please continue to hope. You never know when opportunity comes knocking on the door.